In last week’s post, I told you I wasn’t sure what to bring with me as travel knitting while attending my sister’s graduation in Baltimore. I broke my general rules of travel knitting, and brought 6 skeins of yarn for 3 different projects. It’s a good thing, as I ended up having a lot more time to craft than I expected. I used part or all of 5 of the skeins, and worked on all 3 projects! I finished the Baltic Blue Quinn Bag. I started writing the blog post on it while I was away, but I only brought my iPad with me and I was not able to add links in the post. I will finish the entry and post it tomorrow. The Maple Leaf Shawl was not in a good place for travel knitting, so I did not bring it with me. I also did not bring my spinning wheel — my wheel is not designed for plane transport — so I did no spinning this past week. I brought 3 skeins of yarn for the Granny Square Blanket, one in each color. I worked on Granny Squares on the flight to Baltimore, every time we were in the car, and at the graduation (we arrived 2 hours early). 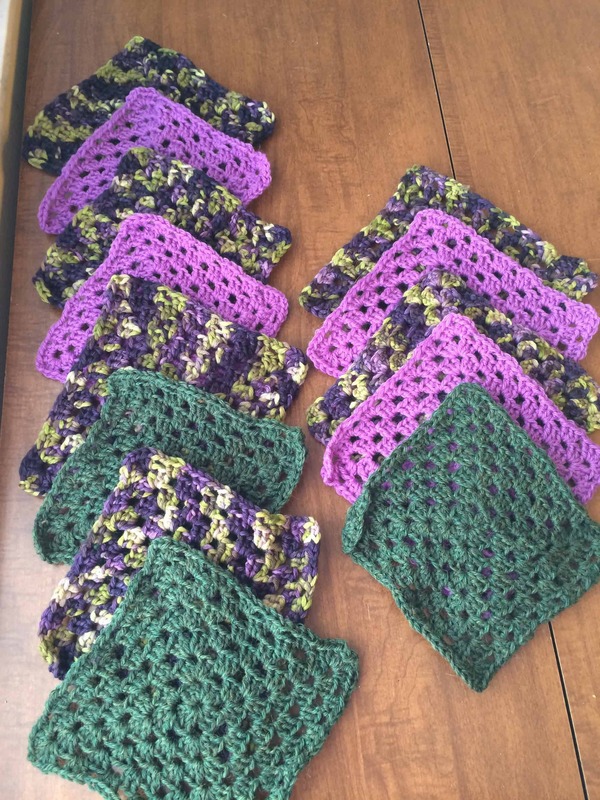 I made a total of 8 granny squares while I was away! I used up all of the multicolored yarn, and all but very small quantities of the green and purple. That means I have finished a total of 13 squares so far. My goal is to make a total of 35 squares by the end of July, and assemble to blanket in August. I am right on track to meet that goal! Last year, I decided to make monsters for charity. My cousin Avery works at Hartford (Connecticut) Children’s Hospital on a ward with chronically sick children. When I’ve finished a few monsters, I will send them to her so she can bring them in to work. This is one of the projects I brought with me as travel knitting. It will be one of my projects for Round 2 of Quidditch. The pattern I use is Hugo the Couch Potato Monster from Rebecca Danger’s The Big Book of Knitted Monsters . I picked Hugo because his legs are knitted onto his body and are therefore more rigid than some of the other patterns and because his arms are rather short. This means the appendages are less likely to get tangled up with any equipment or IV lines. The yarn I use is Vanna’s Choice. It is a fairly soft acrylic and I can just squeak out one Hugo from a skein. In order to get one Hugo from a skein, I do have to make some modifications. 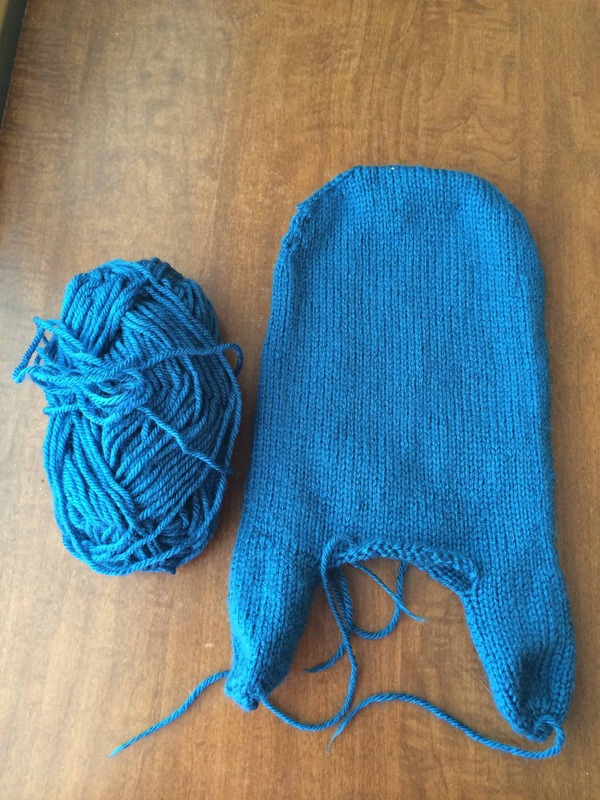 I knit fewer rounds on the main part of the body and I make the arms even shorter than the pattern describes. If I don’t make these modifications, I run out of yarn. I haven’t made a monster since December, and I forgot exactly how I do the modifications. I usually make each leg 6 stitches smaller around than the pattern calls for, because I like the arms and legs to be the same size. On the first round of the main body, I increase 12 stitches (6 for each leg) so that I have the correct number of stitches for the body. I forgot to do those increases on the Sapphire Monster. I ended up with a lot of extra yarn! I think that if I make another smaller Hugo I will be able to make a third, multicolored small Hugo with the leftover yarn from the other two! I still have to make the arms. I lost the stitch marker I was using on this project, and did not have another small stitch marker with me. I also need to sew on his face and stuff him. In order to use this project for Quidditch, I need to finish it by the 25th, which should be no problem. The final project I brought with me to Baltimore is the Begonia Swirl Shawl. This project is my Order of the Phoenix Mission; cast on day for Missions was Sunday the 18th. My sister attended a wedding that evening, so I had lots of time to knit. By the 18th, I had already finished all the granny squares and the monster, so the only project I had to work on from Sunday through Wednesday was this shawl. My plan was to knit 12.5% of this shawl this week. Since I was already out of other projects, I decided I would try to knit 25% of the shawl, meeting both this week’s goal and next week’s goal. Once I was home, I could then focus on my other HPKCHC classes, OWL, and Quidditch projects. The end of May is coming up quickly and I haven’t met all my goals for those other projects yet! The pattern calls for US size 4 needles (3.5 mm). The yarn I’m using is the Good for Ewe Mirrorball yarn I bought at Nomad Yarns booth at The Fiber Event. The yarn suggests knitting on a US size 3. For lace projects, my rule of thumb is to go up two needle sizes from the recommended needle size, so I cast on the Begonia Swirl Shawl with US size 5 needles. I knit the first 18 rows and decided I did not like the fabric. It was too open. So I ripped everything out and reknit it on the recommended size 4 needles. I liked the fabric much better. Even with this setback, I managed to knit the first 25% of the shawl by the time my plane landed back in Orlando. I won’t work on this project again until after June 1, so I can get my other planned projects on schedule. 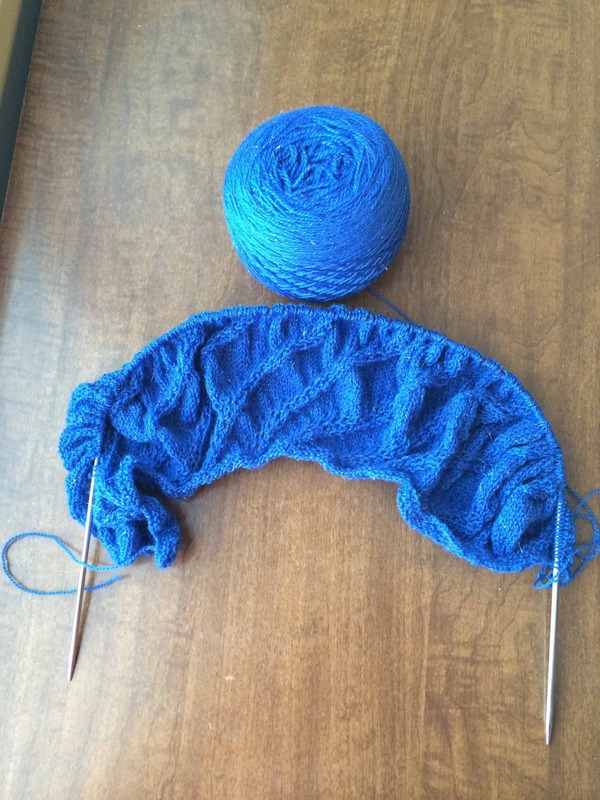 By next weeks WIP Wednesday, I need to finish the Maple Leaf Shawl, the Sapphire Monster, and another project for Quidditch. In an emergency, I can use one or more of the completed granny squares as Quidditch projects. I also need to finish at least one other HPKCHC class project. I have turned in the Palindrome Scarf. I will turn in the Maple Leaf Shawl and at least one granny square for classes, leaving me with 3 more class projects to be finished by May 31. I can use the granny squares for the rest of the class projects, but I did have other projects lined up. We’ll see how it goes. I also need to spin at least 2 more ounces of fiber for my OWL. My goal was to spin 8 ounces by the end of the month; I have only done about 2 ounces so far, putting me a little behind. I’ve got a lot of work to do if I want to meet my goals, but I am still optimistic about my ability to finish it all!